Fresh fruits and vegetables are essential to a healthy diet but are not often as available to lower income families. 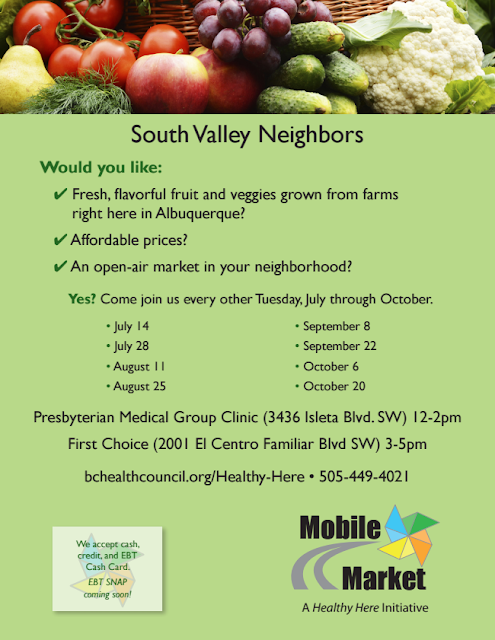 That is why the Bernalillo County Community Health Council, Presbyterian Community Health, The Storehouse, Agri-cultura Network, and Street Food Institute have joined forces to ensure that locally grown produce is available at affordable prices in two neighborhoods of Albuquerque: the South Valley and the International District. 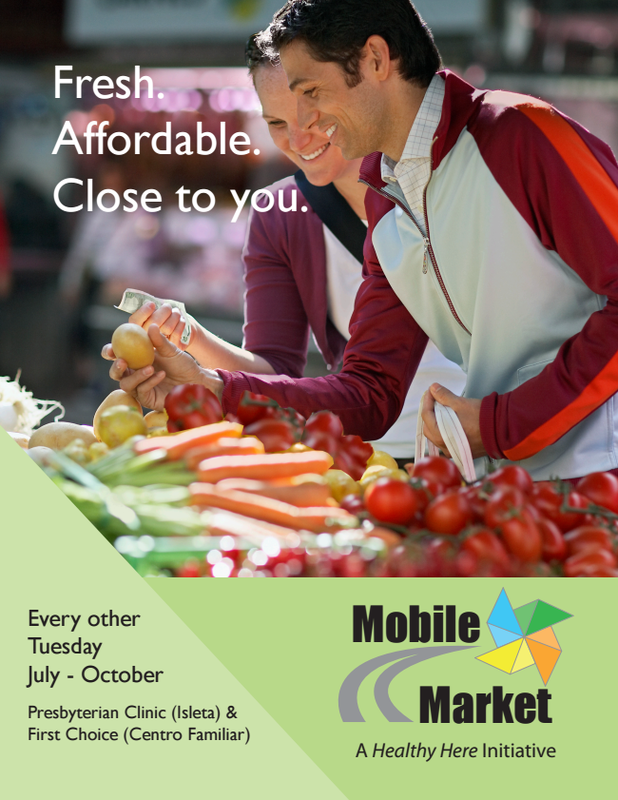 A mobile market will be set up in those neighborhoods every other Tuesday between now and the end of October. "Any resident can come and purchase fresh produce at low prices," said Sara Nelson, a spokesperson for the inaugural Mobile Market project in Albuquerque. "They just need to register one time and then they can shop." First Nations (5608 Zuni SE map) 12:00-2:00 p.m.
UNM SE Heights Clinic (8200 Central SE map), 3:00-5:00 p.m.
Presbyterian Medical Group Clinic (3436 Isleta Blvd SW map) 12:00-2:00 p.m.
First Choice (2001 El Centro Familiar SW map) 3:00-5:00 p.m. So what do the residents get? Chances are there won't be a lot of tomatoes in July, but they might be more available in August and September. 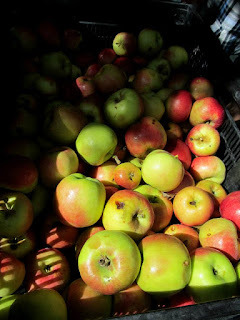 "The produce changes as the harvests change but we're always trying to provide a variety of vegetables and fruits. Depends upon availability," said Nelson. And there is a bonus. "After shopping, residents can enjoy a free sample of food that the Street Food Institute prepares," said Nelson. Residents only need to register one time to shop for the produce and enjoy the food samples. The Mobile Market accepts cash, credit, and EBT Cash Card. EBT SNAP will be coming soon. The project is funded by the Centers for Disease Control and Prevention and by a REACH grant provided via through Presbyterian Healthcare Services. Here is the flier that was circulated to residents of the South Valley. A similar flier was prepared for residents of the International District. What a good idea! Who can people contact to participate or get a copy of the other flyer?